Anti-Trident demonstrations are taking place across Scotland ahead of Monday's House of Commons vote on whether to renew Britain's nuclear deterrent. Former prime minister David Cameron said Trident was an "essential deterrent" to both Britain's security and the overall security of Nato. David Mackenzie, from the coalition said: "Early calculations indicate that this is one of the biggest public demonstrations in Scotland for many years, showing just how people outraged people feel about this ghastly business." 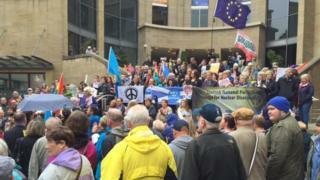 Events included a demonstration at the Mound in Edinburgh, which attracted about 500 people, including SNP MP Tommy Sheppard, and a rally at Buchanan Street's steps in Glasgow, where speakers included SNP politicians Bill Kidd and Alison Thewliss. Smaller rallies also took place outside Scotland's cities, including Cromarty in the Highlands and the North Ayrshire town of Largs, where about 50 people attended. Sandy Thomson, who attended the Cromarty event, said: "We felt we had to get out to show our opposition to the Trident plan. "We had a good representation here, including former Moderator of the Church of Scotland Alan McDonald. We also had two minutes of silent reflection for the victims of the violence in Nice and Turkey." Les Robertson, from Dumbarton, said: "The people of Scotland have overwhelmingly voted for MPs and MSPs who support unilateral nuclear disarmament, yet nuclear warhead convoys regularly travel through our towns and cities and their deadly cargo is stored just 30 miles from Glasgow. "It's time to stop this madness and start investing in our communities rather than weapons of mass destruction." The Scottish government had pledged it would get rid of nuclear weapons if Scotland voted to leave the UK. The MoD has said Faslane is the best place for the weapons to be based. At David Cameron's final PMQs this week, SNP Westminster leader Angus Robertson said one of Theresa May's first tasks as the new prime minister would be to impose Trident "against the will of almost every single MP from Scotland". Mr Cameron responded: "On Trident, there will be a vote in this house and it's right that this house should decide and many people in Scotland support our nuclear deterrent, maintaining it and the jobs that come to Scotland." The SNP and the Greens are opposed to the nuclear deterrent, while Scottish Labour voted to oppose it at the party's conference last year. The UK Labour is currently undertaking a defence review, which is reported to leave open the option of retaining Trident despite leader Jeremy Corbyn's lifelong support for unilateral disarmament.